More than 700 young people from across Hertfordshire took part in a successful interactive careers event to inspire the next generation of health and social care heroes. 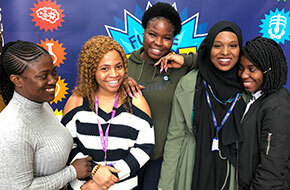 ‘Future Heroes’ Health and Social Care Careers Expo took place at the Fielder Centre in Hatfield, on Tuesday 02 April 2019. Radica Hardyal, senior midwifery lecturer at the University of Hertfordshire was one of 70 professionals, including nurses, doctors, physiotherapists, social workers and radiologists, on hand to give her experience as a health and social care hero. Feedback showed a third of young people were interested in training as a nurse or midwife. 13 per cent were considering medical school. 10 per cent wanted to join the ambulance service, with another 10 per cent contemplating a career in social care. As well as a range of hands-on activities and workshops, students had the opportunity to immerse themselves in a virtual reality experience of living with dementia or autism. To find out more about working in health or social care in Hertfordshire, visit www.futureheroes.org.uk.